Aston Replay is installed in all of the central pool teaching rooms. 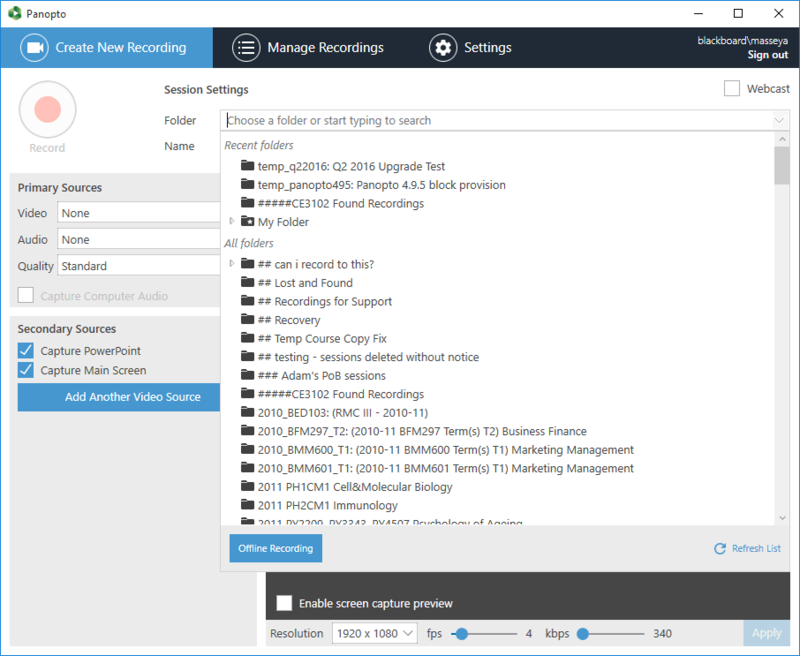 Before you make the first recording for a module – have you provisioned its Blackboard course? If you (or another instructor on the Blackboard course) haven’t, you won’t be able to make recordings for the module. Follow these instructions before you get to the room. At the end of your session, click stop. Double click the Panopto Recorder, on the desktop. The Panopto Recorder will open a Blackboard login screen. Enter your username & password, then click on Login. Ensure that the course has been provisioned from Blackboard to Panopto. Login to Blackboard and confirm that you are enrolled on the appropriate course that you intended to record content for. Many staff have multiple Blackboard accounts and sometimes the wrong account is enrolled. If you need to choose another folder, click in the box. As Panopto remembers the last folder you recorded to, you can skip to step six if the correct folder is displayed. Click on the required folder. Your most recently used folders are listed at the top. If you have a lot of courses, you might find it easier to type in the box which will narrow the results down for you. If required, change the title of the session. Panopto fills in the title of the session with the current date and time. You don’t have to leave that in as Panopto keeps record of when the session was made. Many Aston staff prefer to title sessions such as ‘Session One’ or ‘Week One’ etc, or by the title of the session. If required, switch the mic on and test the levels. You should see the volume meter move up and down in time with your voice. When you’re ready to start, click the record button at the top left of the Panopto recorder. When recording, use the Pause button to temporarily pause recording, allowing you to resume again, or the Stop button to stop recording. Don’t worry, if you forget to click on Upload, and just shut the computer down, it will automatically upload the next time the Panopto recorder is used on the computer. You will see the Manage Recordings screen, showing you the progress of this session uploading. 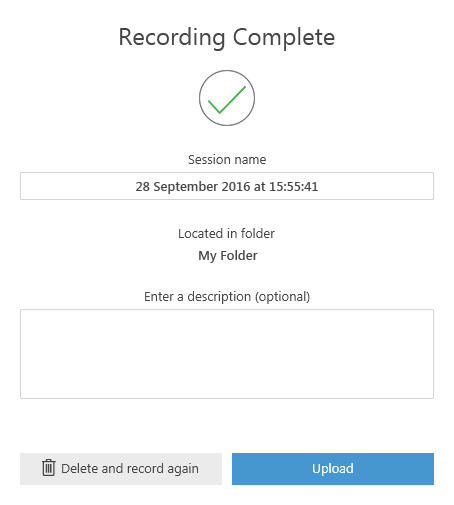 If you want to make another recording straight away, you can click on Create New Recording and begin the process again. In a hurry? Is the next class waiting to get into the room? When the recording has finished uploading, it will go into the processing queue. You will receive an email when it has finished processing and is available to view.